April 2015, New York, NY – Just blocks from the Yerevan Opera Theater stands another cultural institution that reflects on the world-class musical talent that Armenia has produced over many decades. And yet for all the brilliance emanating from the Tchaikovsky Secondary Music School, the walls, floors, ceilings, classrooms and public facilities have certainly seen better days. The premises are long overdue for a complete overhaul to meet the needs of a new generation of musically-gifted Armenian youth. Left: current condition of the music classroom; Right:	CG rendering of how the renovated music classroom will look. While there is no shortage of classically trained musical masters in Armenia, the Tchaikovsky Secondary Music School is the only government-funded school in the country that is uniquely equipped to cultivate aspiring musicians during their formative years. In fact, unlike all other public schools in Armenia, which are all under the domain of the Ministry of Education, the Tchaikovsky School falls under the aegis of the Ministry of Culture. This special status speaks to the national passion and priority for all things musical—especially classical. When students graduate from the Tchaikovsky School, they not only have earned an impressive academic diploma but also the credentials to enter Armenia’s Music Conservatory without first completing certain university requirements. Over 70% of students of the Yerevan State Conservatory of Music are graduates of the Tchaikovsky Secondary Music School. Students of the school have been awarded with hundreds of diplomas, awards and medals for their outstanding participation in national, regional and international competitions. The Tchaikovsky School project speaks to three main pillars of the Armenia Fund nation-building model: Education, Infrastructure and Community. 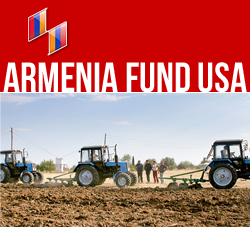 As such, Armenia Fund USA believes that this one-of-a-kind institution is well worth the large-scale investment. Reason enough why the project is and will be the focus of many fundraising appeals while this dilapidated structure transforms into a gleaming contemporary landmark. The reconstruction of the Tchaikovsky School is already in process. Many works need to be completed to bring the school building to the world-class standards of many specialized educational music facilities in Europe and the U.S. Currently, walls, floors, ceilings, windows and doors are being deconstructed and dismantled throughout the building. In addition, earthquake proofing of the building is being put in place, along with the new glass elevator in the main building, which is accessible for people with disabilities and elderly. After this phase is finished, water supply system, ventilation system, electrical wiring and equipment will undergo complete renovation. New granite floors in the halls and corridors, new classroom flooring, new windows and doors will be installed throughout the building. Ceilings and walls will be plastered and painted. The final phase of the construction will be installation of internal video surveillance and fire alarm systems. The newly renovated school building will be equipped with brand new furniture and blackboards. The outdoor area of the Tchaikovsky Secondary Music School will not be left unattended either as the school is located in the heart of Yerevan. The overall budget of the project includes the costs of area improvements, such as replacing the curbs, tiling, asphalting and concrete layering of the school’s entrance area and surroundings. Students will be able to rest and get prepared for their classwork on the benches at the back yard of the school, which will be installed as part of the project as well. While the Tchaikovsky Secondary Music School is being renovated, classes for the school students are conducted in different music schools around Yerevan city. The estimated completion date for this essential for the cultural future of Armenia and extremely rewarding project is September 2016. After the state-of-the-art school facility is fully functional, Armenia Fund USA plans to invest in new musical instruments, master classes, as well as international student exchange programs for the students of the Music School.